Cartography is a skill that requires several disciplines to achieve accuracy. Skills such as mathematics, geometry, navigation and organisation, are minimum requirements for the cartographic enterprises that appear to have been executed in the past. 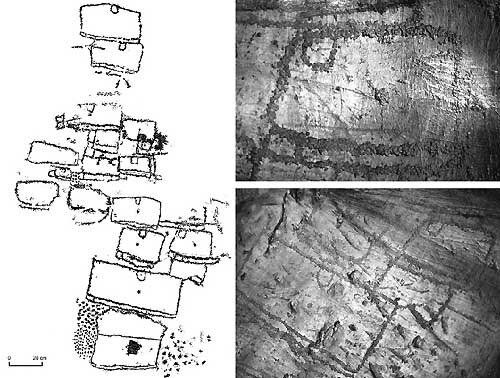 The unofficial oldest map in the world was discovered in Ukraine in 1966, dating from about 11 - 12,000 B.C. Inscribed on a mammoth tusk it was found in Mezhirich, Ukraine. It has been interpreted to show a river with dwellings along a river. However, the best claim to the title of "the earliest map in the world" appears on a beautifully engraved silver vase from Maikop in Ukraine, according to James and Thorpe. It was found in a Ukrainian tomb dated at 5,000 years old. It shows two rivers, a mountain range, a lake or sea and wild animals (3). 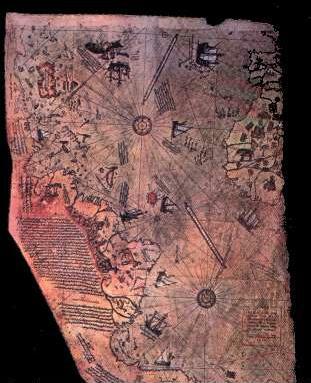 The oldest map in the world.. Inscribed on mammoth tusk, Ukraine. What may be one of the oldest authenticated maps in the world, is dated to approximately 6000 BC, and was unearthed in an archaeological excavation at Catal Huyuk in west-central Turkey in 1963. Its subject matter was the Neolithic town it was found in. Painted on a wall, it showed the streets and houses in plan form, lying beneath the profile of the mountain of Hazan Dag with its volcano erupting. World map of Babylon (500 BC) British Museum, London Great Britain. Although the first 'maps' were more conceptual than geometric, the skills required for accurate cartography can be seem in the earliest maps.. The Babylonian "map of the world" (BM 92687). Babylonian "map of the world" in the British Museum, London was long claimed as the earliest extant map. The map was composed in Babylonia and is the only Babylonian map drawn on an international scale. It is a Neo-Babylonian (Persian Period, circa 500 BCE) copy of an original dating to the Sargonid Period, circa late eighth or seventh century BCE. The clay tablet is a drawing and textual description of the Babylonian cosmos. It is oriented to the north-west. (It is uncertain whether the accompanying cuneiform text was composed together with the map.) It is the only known map of the world dating from the Neo-Babylonian Period. All other maps have a purely local focus. It depicts a "bird's-eye" view of the world and shows a flat, round world with the city of Babylon in the centre. (Circa 500 BCE Babylon was still a flourishing city and regarded as the centre (i.e., the "hub") of the world. In the third millennium BCE Nippur was considered to be the city at the centre of the world.) It is likely that the Sumerians made the city of Nippur the centre of the universe (a Sumerian Rome) from about 2300 BCE (just prior to the Ur III Period). Political supremacy was regarded as conditional on the possession of Nippur. With the rise to political supremacy of the Babylonian kings, from the early 2nd-millennium onwards, it was possible for Babylon to claim the central position and replace Nippur as the centre of the universe. The map depicts the world as two concentric circles, with triangular areas radiating from the outer circle. The area within the inner circle represents the central continent where Babylon and Assyria are located. The area between the two circles is the earthly (cosmic?) ocean. The area beyond the outer circle consists of the triangular areas, which are the uncharted regions. The continent on the map contains various geometric shapes representing places and topographic features. The place names include the countries of Assyria (indicated north-east of Babylon), Urartu (Armenia) (indicated north of Assyria), the land of Habban (South Yemen) (indicated south-west of Babylon) and the city of Babylon. The topographic features include a mountain, a swamp, and a channel. (The mountains are located at the top, in the north.) Babylon is represented by a large rectangle encompassing almost half the width of the central continent. Assyria is represented as a small oval. (Various nameless places are also indicated by ovals.) The Euphrates River, which originates in the mountains at the top of the map, runs through Babylon and flows into the marshes at the bottom of the map. The continent is surrounded by the circle of salty ocean. The map schematically portrays the entire kingdom of Babylonia. The text contains the names of countries and cities but, on the reverse side, the text is largely concerned with a description of the seven unnamed outer regions ("islands") which are depicted in the form of equal triangles rising beyond the encircling earthly (cosmic?) ocean. 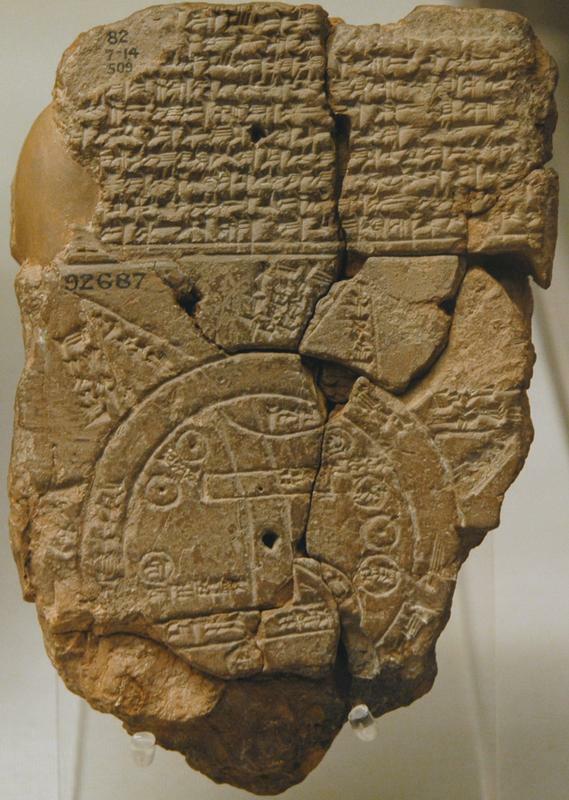 The text (on both sides of the tablet) shows that the map attempts to depict the entire world. The emphasis on distant places in the text accompanying the map indicates that the likely purpose of the map was to locate and describe distant regions. The text of the reverse of the tablet describe the "seven islands" in detail. (From the paucity of the information given it is evident that the Babylonians knew little about these "islands." Mostly, the description given is mostly about their various degrees of brightness.) From the text on the reverse of the tablet, and the inscriptions on the map itself, it can be determined that the first "island" lay in the south-east. the second "island" lay in the south-west, and so on, so that the sequence of the "islands" is somewhat analogous with the hands of a modern clock. The descriptions of the first and second outer regions are not preserved. Other textual sources describe he earthly ocean as being enclosed by a double range of mountains, those to the east and those to the west (the "sunrise" and "sunset" range, respectively. The map has a definite orientation - it is inclined. The orientation is such that that the northwest is at the top. Thus the Babylonian system of orientation did not follow the perpendicular plane - north, west, south, and east - of our Western cardinal points. The Babylonian system of orientation was based upon the prevalent winds. The northwest wind was sent from the goddess Ishtar and was a favourable wind. Note the similarity between the Babylon map and St. Isildoe's Map of the world. (above) 1475. Eckhard Unger. Cosmos Picture to the World Map. (Volume 2, Pages 1-7) 1937. Imago Mundi. The map centres at the junction of the 23.5˚ parallel (Tropic of cancer), and the longitude of Alexandria. Siberian article: THE MAP OF "THE CREATOR"
A find of Bashkir scientists is contrary to traditional notions of human history: Stone slabs covered with the relief map of Ural Region. "The more I learn the more I understand that I know nothing," - the doctor of physical and mathematical science, professor of Bashkir State University, Alexandr Chuvyrov admits. Namely Chuvyrov made that sensational find. Already in 1995, the professor and his post-graduate student from China Huan Hun decided to study the hypothesis of possible migration of Old Chinese population to the territory of Siberia and Ural. In an expedition to Bashkiria, they found several rock carvings done in Old Chinese language. These finds confirmed the hypothesis of Chinese migrants. The subscriptions were read. They mostly contained information about trade bargains, marriage and death registration. Though, during the searches, notes dated the 18th century were found in archives of Ufa governor-general. They reported about 200 unusual stone slabs which were situated not far from the Chandar village, Nurimanov Region. Chuvyrov and his colleague at once decided that slabs could be connected with Chinese migrants. 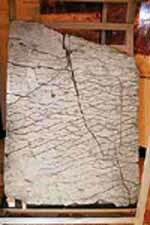 Archive notes also reported that in 17th-18th centuries, expeditions of Russian scientists who investigated Ural Region had studied 200 white slabs with signs and patterns, while in early 20th century, archaeologist A.Schmidt also had seen some white slabs in Bashkiria. This made the scientist start the search. In 1998, after having formed a team of his students, Chuvyrov launched the work. He hired a helicopter, and the first expedition was flying around of the places where the slabs were supposed to be. Though, despite all efforts, the ancient slabs were not found. Chuvyrov was very upset and even thought the slabs were just a beautiful legend. The luck was unexpected. During one of Chuvyrov's trips to the village, ex-chairman of the local agricultural council, Vladimir Krainov, came to him (apropos, in the house of Krainov's father, archaelogist Schmidt once stayed) and said: "Are you searching for some stone slabs? I have a strange slab in my yard." "At first, I did not took that report seriously, - Chuvyrov told. - Though, I decided to go to that yard to see it. I remember this day exactly: July 21, 1999. Under the porch of the house, the slab with some dents lied. The slab was so heavy that we together could not take it out. So I went to the city of Ufa, to ask for help." In a week, work was launched in Chandar. After having dug out the slab, the searches were stroke with its size: it was 148 cm high, 106 cm wide and 16 cm thick. It weighed at least one ton. The master of the house made special wooden rollers, so the slab was rolled out from the hole. The find was called "Dashka's stone" (in honour of Alexandr Chuvyrov's granddaughter born the day before it) and transported to the university for investigation. After the slab was cleaned of earth, the scientists could not believe their eyes... "At first sight, - Chuvyrov says, - I understood that was not a simple stone piece, but a real map, and not a simple map, but a three-dimensional. You can see it yourself." "How did we manage to identify the place? At first, we could not imagine the map was so ancient. Happily, relief of today's Bashkiria has not changed so much within millions of years. We could identify Ufa Height, while Ufa Canyon is the main point of our proofs, because we carried out geological studies and found its track where it must be according to the ancient map. Displacement of the canyon happened because of tectonic slabs which moved from East. The group of Russian and Chinese specialists in the field of cartography, physics, mathematics, geology, chemistry, and Old Chinese language managed to precisely find out that the slab contains the map of Ural region, with rivers Belya, Ufimka, Sutolka," - Alexandr Chuvyrov said while showing the lines on the stone to the journalists. - You can see Ufa Canyon - the break of the earth's crust, stretched out from the city of Ufa to the city of Sterlitimak. At the moment, Urshak River runs over the former canyon." The map is done on a scale 1 : 1.1 km. Alexandr Chuvyrov, being a physicist, has gotten into the habit of trusting the results of this investigation. The Geological structure of the slab was determined: it consists of three levels. The base is 14 cm chick, made of the firmest dolomite. The second level is probably the most interesting, "made" of diopside glass. The technology of its treatment is not known to modern science. Actually, the picture is marked on this level. While the third level is 2 mm thick and made of calcium porcelain protecting the map from external impact. "It should be noticed, - the professor said, - that the relief has not been manually made by an ancient stonecutter. It is simply impossible. It is obvious that the stone was machined." X-ray photographs confirmed that the slab was of artificial origin and has been made with precision tools. At first, the scientists supposed that the ancient map could have been made by the ancient Chinese, because of vertical inscriptions on the map. As well known, vertical literature was used in Old Chinese language before 3rd century. To check his supposition, professor Chuvyrov visited Chinese empire library. Within the 40 minutes he could spend in the library according to the government's permission; he looked through several rare books, though not one of them contained literature similar to that one on the slab. After the meeting with his colleagues from Hunan university, he completely gave up the version about "Chinese track." The scientist concluded that porcelain covering the slab had never been used in China. Although all the efforts to decipher the inscriptions were fruitless, it was found that the literature had hieroglyphic-syllabic character. Chuvyrov, however, states he has deciphered one sign on the map: it signifies latitude of today's city of Ufa. The longer the slab was studied, the more mysteries appeared. On the map, a giant irrigation system could be seen: in addition to the rivers, there are two 500-metre-wide channel systems, 12 dams, 300-500 metres wide, approximately 10 km long and 3 km deep each. The dams most likely helped in turning water in either side. To create them over 1 quadrillion cubic metres of earth was moved. In comparison with that irrigation system, Volga-Don Channel looks like a scratch on the today's relief. As a physicist, Alexandr Chuvyrov supposes that now mankind can build only a small part of what is pictured on the map. According to the map, initially, Belaya River had an artificial river-bed. It was even difficult to determine an approximate age of the slab. At first, radio-carbon analysis was carried out, afterwards levels of the slab were scanned with uranium chronometer, though the investigations showed different results and the age of the slab remained unclear. While examining the stone, two shells were found on its surface. The age of one of them - Navicopsina munitus of Gyrodeidae family - is about 500 million years, while of the second one - Ecculiomphalus princeps of Ecculiomphalinae subfamily - is about 120 million years. Namely that age was accepted as a "working version." "The map was probably created at the time when the Earth's magnetic pole situated in the today's area of Franz Josef Land, while this was approximately 120 million years ago, - professor Chuvyrov says. - The map we have is beyond of traditional perception of mankind and we need a long time to get used to it. We have gotten used to our miracle. At first we thought that the stone was about 3,000 years. That mis-calculated age was gradually growing. Then we identified the shells ingrained in the stone to identify some objects. But, who could say that the shell was alive while being ingrained in the map? The map's creator probably used a petrified find." What could be the destination of the map? That is probably the most interesting thing. Materials of the Bashkir find were already investigated in Centre of Historical Cartography in Visconsin, USA. The Americans were amazed. According to them, such three-dimensional map could have only one destination - a navigational one, and it could be worked out only through aerospace survey. Moreover, namely now in the US, work is being carried out in the creation of a world three-dimensional map like that. The Americans intend to complete the work by 2010. The question is that while compiling such three-dimensional map, it is necessary to work over very many figures. "Try to map at least a mountain! - Chuvyrov says. - The technology of compiling such maps demands super-power computers and aerospace survey from the Shuttle." So, who then did create this map? Chuvyrov, while speaking about the unknown cartographers, is wary: "I do not like talks about some UFO and extraterrestrial. Let us call the author of the map simply - the creator." It looks like that who lived and built at that time used only air transport means: there are no marked roadways on the map. Perhaps they used water ways. There is also an opinion, that the authors of the ancient map did not live there at all, but only prepared that place for settlement through draining the land. This seems to be the most probable version, though nothing could be stated (as fact) for the time being. Why not assume that the authors belonged to a civilization which existed earlier? Latest investigations of the map brings one sensation after another. Now, the scientists are sure of the map being only a fragment of a big map of the Earth. According to some hypothesis, there were totally 348 fragments like that. The other fragments could be probably somewhere near there. In outskirts of Chandar, the scientists took over 400 samples of soil and found out that the whole map had been most likely situated in the gorge of Sokolinaya Mountain (Falcon Mountain). Though, during the glacial epoch it was tore to pieces. But if the scientists manage to gather the "mosaic," the map should have an approximate size of 340 x 340 m. After having studied the archive materials, Chuvyrov ascertained the approximate place where four pieces could be situated: one could lie under one house in Chandar, the other - under the house of merchant Khasanov, the third - under one of the village baths, the fourth - under the bridge's pier of the local narrow-gauge railway. In the meantime, Bashkir scientists send out information about their find to different scientific centres of the world; in several international congresses, they have already given reports on the subject: The Civil Engineering Works Map of an Unknown Civilization of South Ural." The find of Bashkir scientists has no analogues. With only one exclusion. When the research was at its height, a small stone - chalcedony - got to professor Chuvyrov's table, containing a similar relief. Probably somebody, who saw the slab wanted to copy the relief. Though, who and why? 3). Peter James & Nick Thorpe. Ancient Inventions. 1994. New York: Ballantine Books.